It seems hard to believe that Club President, Barrie Williams has died. Barrie was the perennial youth, looked at least 20 years younger than his 79 years on this earth. Always cheerful, ready for a laugh and one of the most accomplished drivers of his generation. Barrie started his career in rallying, in a Mini, that also served him in circuit racing, sprints and in any other motor sport event that took his eye. In later years he became a stalwart of the Goodwood Revival meetings, sometimes driving/sharing six cars at one meeting. In between times, he raced in Formula 3, big saloons, little saloons and just about every classic car you can name in his exploits at Goodwood. Best remembered among the marshalling fraternity for his outrageous driving style in a Mazda RX3 – fully sideways and waving to the marshals. Barrie always had time for the marshals and it was no surprise when he became the populous choice for Club President when Stuart Turner, then President, and Peter Roberts, Chairman, decided to stand down at the end of 2004. We had several suggestions for new President. Barrie won that ballot by a huge margin. Barrie was pleased with his new appointment and, time permitting, he attended as many functions as he could and never missed an opportunity to display the Club badge. Soon after his appointment, he landed upside down in a gravel trap at Silverstone – calling immediately for special help, reminding his rescuers that he was the Marshals’ Club President. Disappointment followed, when he found there was no lady marshal waiting to give him the kiss of life!! 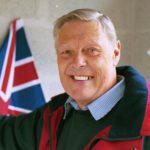 He was elected a member of the British Racing Drivers’ Club in 1971, served on the BRDC Board for fifteen years and remained a proud and prominent member of that Club until his sad demise. Speaking privately to Barrie, one of his proudest achievements was his part in setting up the under-17 driving school at Silverstone, and the great number of youngsters he taught to drive and prepare for their driving tests. The course has progressed since the early days and it enables teenagers to get through their tests without too much difficulty. RIP, Barrie; you will be fondly remembered by very many people and marshals will miss you as a very popular President. The BMMC extends its deepest condolences to Barrie’s partner Kathy and to his many friends throughout the motor sport world. A funeral for Barrie ‘Whizzo’ Williams will take place on Friday 21 September at 11:30am at St Peter’s Church, Bromyard HR7 4DZ. All are welcome to attend. Refreshments will be held after at the Plough Inn, Stoke Lacy, Bromyard HR7 4HG. The family have asked if guests could wear a flash of orange (Barrie’s racing helmet colour) and marshals in overalls will be welcomed. No flowers are to be sent but donations can be made to Dementia UK. A celebration of Barrie’s life will be held on Saturday 29 September in the BRDC Clubhouse, Silverstone NN12 8TN at 3.00pm. All are welcome to attend including marshals in overalls.